Automation of industry. Conflict in Kashmir. Venezuelan crisis. Drug smuggling in the Golden Triangle. Asylum seekers. Virus outbreaks in African countries. These are the worldly issues tackled at this year's Middle School Model United Nations conference this past weekend. 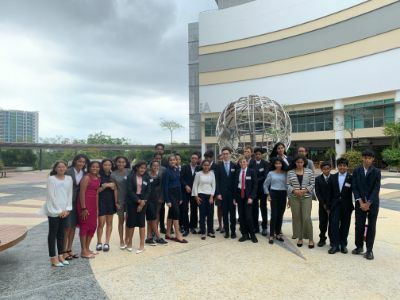 Students from visiting Singapore schools and over 40 of our UWC students collaborated to write, debate, submit and amend resolutions coming up with suggestions and solutions to some of the biggest issues facing our world today. The level of debate demonstrated that we are in solid hands with these future leaders at the helm. Congratulations to all of our delegates and the High School Executive team who worked to run an incredibly successful 2 day conference.